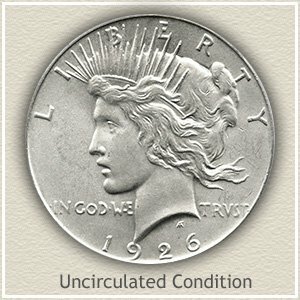 In moderately worn condition 1926 Peace silver dollar value is $17.98 currently. Although priced in line with many other dates, in reality, it is not as plentiful as its worth suggests. Found less frequent than common dates, think of your 1926 silver dollar as a somewhat scarce coin to find. Peace dollars trading in bulk are represented with only an occasional 1926, but contain far more 1922 and 1923 dates. Additionally, the value chart highlights those in above average condition, "extremely fine" quickly gain a premium collector status. 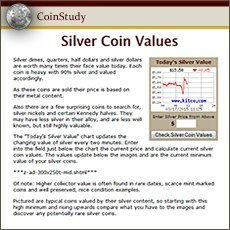 Determining higher value is found by judging and separating "collector quality" from the "bullion quality" silver dollars in your group. The condition of your coin and how much detail remains is of special importance. Collectors search for nice quality examples and they are the market paying the premium prices. Worn, less detailed 1926 dollars trade as bullion coins, currently close to their silver value. Judging the quality of your silver dollars and finding an accurate value is an important subject covered in the "grading silver dollars" section further down the page. Of importance to worth is the presence of mintmarks on your silver dollar. Collectors seek to identify coins from the three different mints producing coins in 1926 and judge each separately. Your coin was struck at either the San Francisco mint represented by a small "S", Denver mint used a "D" or the main mint in Philadelphia, no mintmark. Look on the reverse, near the rim, they are small and if none is found your coin is from the Philadelphia mint. Pictured is a "gem" quality silver dollar. To have survived in this level of preservation is rare for the 1926 Peace dollar. Far too many were released into circulation, from a low original mintage of less than two million, soon losing their luster and becoming worn. And sadly many were also melted for their silver content. In today's market these reduced numbers of collector quality dollars are now sought by a growing number of collectors. With the reality that worn, bullion grade examples are the bulk of the 1926 dollars in existence. Studying auction appearances and top bids of gem condition silver dollars shows the current strong collector demand is meeting a small supply. Bidding at a David Lawrence rare coin auction continued untill a final $506 was necessary to win the coin pictured. With most 1926 silver dollars valued far below this high, the coin is notable for its brilliant unbroken luster and lack of marks to the surface. Collector quality Peace dollars far outpace bullion quality in value. In most instances it comes down to condition of the coin. Date and mintmark are a factor, however a close inspection of condition is often the key to accuracy of value. Collectors judge the condition of their coins and assign a "grade" to help determine values. 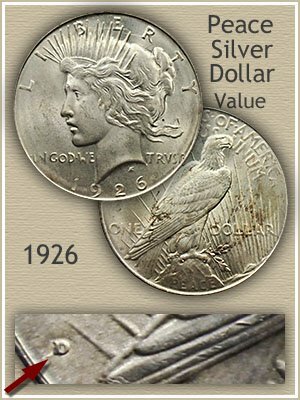 Examine your 1926 Peace silver dollar and compare to the images and follow the descriptions. Soon it is easy to spot the difference from one grade to the next and you begin to clearly recognize a valued collector quality coin. Now it is possible, by using the chart above, to find an accurate value. Follow the above process and examine the reverse. Mint luster should remain unbroken on the eagle's wing feathers. Another area quick to wear is the front of the beak. Again no dulling of the metal should be present. 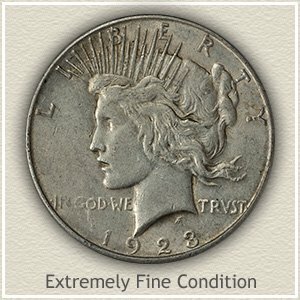 Extremely Fine: 1926 Peace silver dollar value in "extremely fine" condition is the separation into collector quality. Only very light wear is acceptable for this grade and limited to the very highest parts of the design. A distinct fullness with rounded features to the hair must remain. The tie of hair at the back is still bold with only minimal merging of detail. 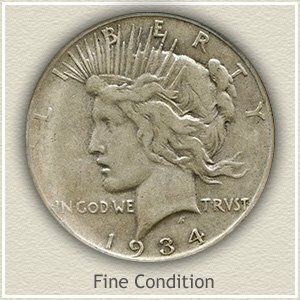 Fine: Your first impression of a silver dollar in 'fine" condition is, yes there is wear but not extensive nor unappealing. As you look closely all raised portions are affected by wear, quickly noticeable is the flattened areas of hair and cheek and also above the eye. Focusing your attention now to the tops of the lettering, motto and date, they have a leveled and smooth quality. Good: Very worn and flattened, with most strands of hair merged defines the "good" grade. 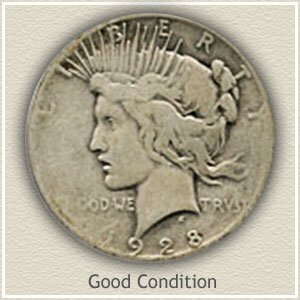 Today a 1926 Peace silver dollar in this condition trades at bullion value, likely never achieving any collectible status. Lettering is now faint towards the rim and on the reverse, feather details over most of the eagle are missing. Values of your Peace silver dollars are influenced by both an active collector market and as a silver bullion coin. 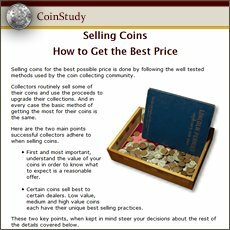 Determine from the chart, all the dates and mints highly valued by collectors, and current bullion value of the ones moving with the silver market.